1 edition of Nursing ethics found in the catalog. Add another edition? Published 2001 by Churchill Livingstone in Edinburgh, New York . SECTION 1: The social context of nursing values. 1. Moral issues in nursing and the ethics of nursing care. 2. Becoming and being a nurse. 3. Responsibility and accountability in nursing. 4. Power-sharing and personal values in nursing ethics. 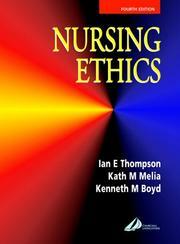 SECTION 2: Practical applications of nursing ethics. 5. What are the key moral issues in health care? 6. Moral dilemmas in direct nurse-patient relationships. 7. Moral dilemmas in nursing groups of patients. SECTION3: Ethics in health policy and administration. 8. Nurses and society: responsibility for managing resources. 9. Nurses and society: agents of health and a social policy. SECTION4: decision-making a moral theory. 10. Making moral decisions and being able to justify them. January 12, 2017 Edited by LeadSongDog Edited without comment.